Buenos Aries is noteworthy for its eclectic architecture, with a wide range of impressive buildings. But when Anat Meidan, an art collector with a passion for La Belle Époque period moved to the city, she was astonished and delighted to discover the extent to which the legacy of the rich Art Nouveau architecture that had flourished there during the first decades of the twentieth century was still very evident. With her extensive, expert knowledge and passion for the period, the author set about researching, documenting and photographing these extraordinary buildings, their exteriors and where possible their interiors, as well as gathering information about the gifted people who designed and built them. She engaged the collaboration of Gustavo Sosa Pinilla, a leading architecture photographer to accompany her on the expeditions around the city. In addition, through her personal charm (and a few well placed connections) she was able to gain access to the interiors of private homes and buildings usually closed to the general public, enabling her to photograph and document interiors not normally accessible. 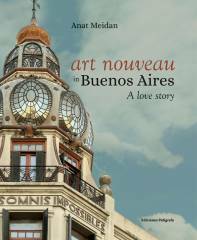 In this meticulously researched, richly illustrated book, with hundreds of splendid photographs, the reader is invited to share with Anat her voyage around the city as she narrates with warmth and enthusiasm the very personal account of her love affair with Buenos Aires, as she goes about discovering its Art Nouveau jewels. >> Anat Meidan, a museum curator with a special interest in the Art Nouveau movement, lives in the Neve Tzedek quarter of Tel Aviv, Israel. She has written and published a book (in Hebrew) about the artistic riches of Istanbul, with a section devoted to Art Nouveau in the city. Currently, she is working on the exhibition The New Woman, focused on three female artists ––Jessie M. King, Margaret Armstrong and Ethel Larcombe––who all worked in the Art Nouveau style across a range of media.